BERLIN (AP) — Eighteen people are feared dead after a bus carrying a group of German senior citizens crashed into a truck on a highway in Bavaria early Monday and burst into flames, police said. Thirty people were injured in the early-morning accident, some seriously, while the 18 still considered missing “are believed to have died on the burning bus,” police said in a statement. The accident took place around 7 a.m. when the bus rear-ended a trailer-truck at the end of a traffic jam on the A9 highway near Muenchberg in Bavaria, not far from the Czech border. 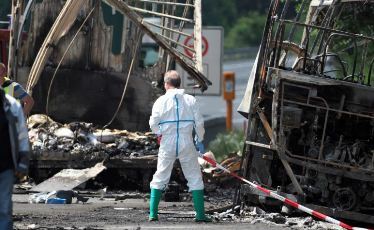 It was not immediately clear what caused the initial traffic jam, but the bus seemed to have burst into flames right after the crash, Dobrindt said. Some 200 emergency crews were at the scene and five helicopters whisked the injured to nearby hospitals. Simple wooden coffins were wheeled in for the remains recovered from the blackened, twisted wreckage of the bus. The accident led to long traffic jams on the A9, the main thoroughfare from Berlin to Munich. Police said the bus was carrying seniors from Saxony in eastern Germany. The news agency dpa reported that all passengers were Germans. Forensic specialists were brought in from Germany’s federal police office to remove and identify bodies from the charred vehicle. Dobrindt said rescue work was difficult because the bus was so badly damaged. “The heat was so strong that nothing that’s inflammable is left from the bus — only the steel frame,” Dobrindt said. The A9 highway remained closed on both sides for hours and police tweeted later that the road leading south would be shut down for the entire day. The relatives of the victims have not yet been contacted because experts are still working on identifying the bodies, Dobrindt said. A phone number was activated to provide family members with information. Psychologists and counselors were talking to the injured and also to the rescue personnel.